The premise behind Void Studios’ hack-n-slash action RPG Eternity: The Last Unicorn is as simple as it is ill-advised: Combine a modern approach to combat with the static camera angles of early PlayStation-era titles in an attempt to create a unique game that tugs a bit on the nostalgia strings. It turns out that unique doesn’t necessarily mean worthwhile, and the anachronistic design elements that have been clumsily mashed together here actually just hamstring each other rather than gelling well together. The result is an unfortunate slog through a world inspired by Norse mythology that runs the gamut from tedious to downright frustrating. This is exacerbated by gameplay choices that only serve to mask the obvious good intentions the designers undoubtedly had all along. The narrative, what little there is, is split between the dual protagonists of Aurehen, a young elf in search of a way to save her cursed homeland, and Bior, a Viking captain who has been separated from the rest of his crew of raiders during a shipwreck. 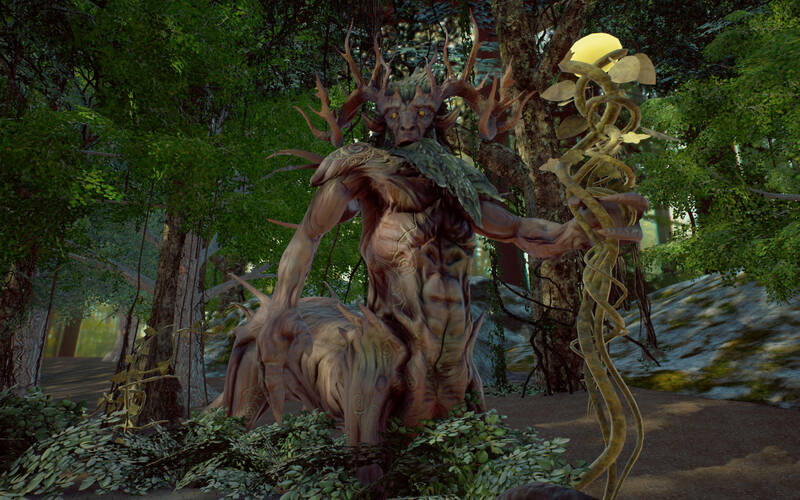 Bior is only playable after Aurehen finds him in the forest and pulls him back from death’s door; apart from this initial meeting, there is very little that their individual storylines have in common with each other. They only even see each other a handful of times, and it isn’t until the game’s final area that switching from one character to the other becomes an option, rather than being dictated by the events of the story. Despite Aurehen and Bior only rarely seeing each other and both being locked into their own stories, the game doesn’t offer much exclusive content for either one. Instead, it requires both of them to spend almost its entire length in the same handful of areas, retreading each path and dealing with the same combat encounters over and over. There are only eight rather small areas in the game, and players will pass through most of them numerous times on the way from one end of the world to the other. A one-way fast travel option exists to visit the vendor area, which is necessary in order to upgrade magical weapons for opening up new areas, but the return trip must be made on foot. All of this is doubled due to the dual protagonists traveling individually, and in what appears to be a cruel joke, the game even throws each of them a late-game fetch quest, requiring revisiting areas yet again to collect items that were there, but couldn’t be interacted with before. Only the game’s final area sports a little bit of relief from this infernal runaround, as it is the only one that can be tackled by both characters more or less at the same time, requiring that players switch from Aurehen to Bior and back several times to complete it. An early embodiment of the mantra “cool design, wasted potential”. Eternity utilizes a fairly standard action RPG combat system, with light attack, heavy attack, and dodge all mapped to different face buttons. Without the option to block incoming damage, combat becomes a back-and-forth dance, requiring well-timed dodges at every turn. The problem is that combat just does not exhibit any grace or fluidity whatsoever. What should have been a case of simple hack ‘n’ slash gameplay doing the trick is instead filled with irritations from start to finish, from poorly-telegraphed enemy attacks leading to cheap deaths to the targeting lock-on system cycling through enemies in a preset order rather than targeting the enemy closest to the player. Enemies can spawn all around the player, leaving no space to dodge away from damage. The player is further hindered by animation issues. Switching weapons entails a cumbersome animation that leaves the player open to harm, and requires that players re-target their foes, making this a questionable tactic at best. Locking on also slows movement speed down to a deliberate prowl, as does healing mid-battle. Most of the game’s boss encounters could have used a bit more polish. Quite a few boss encounters devolve into the player frantically trying to put enough distance between themselves and the boss to heal, while the boss is constantly nipping at their heels. Other boss encounters feature further poor design as well as atrocious AI — one particular boss got stuck by walking into a wall, giving Aurehen free shots, while a fire giant boss spent the entire encounter in spasms when he couldn’t figure out which way to turn to reach Aurehen, who was busy wailing away at him from between his feet. The poor AI and cheap deaths caused by frustrating controls prevent the combat from ever feeling rewarding or satisfying, leading much of this game’s challenge to feel artificial and wholly unearned. To add broken to poorly-designed, the game’s combat system is further plagued by bugs and a plethora of issues stemming from the predetermined camera angles reminiscent of franchises like Silent Hill or early Resident Evil entries. It’s bad enough that common mob enemies can not only spawn but also initiate attacks from off-camera, leading to cases where death can seem to just happen spontaneously and without warning. However, when bosses are able to slink into the camera’s blind spot, leaving the player no recourse to regain the upper hand, there’s a fundamental issue baked into the design. Topping all of this off are numerous little bugs still present in the game that all conspire against the player, such as a vanquished foe remaining targeted, turning the player away from any still-living threats, and glitches during boss battles that immobilized Aurehen or Bior, preventing them from moving or attacking for no discernible reason. With both the structure of gameplay and the mechanics of combat already undermining the game, it’s nice that the graphics, at least, get a pass. It’s clear that the designers put a lot of effort into designing the environments, which may not be terribly original but are littered with crumbled statues, collapsed ruins, and other fantastical sights that help hint at a bustling world that existed in the past. Character models don’t come across as favorably, with stilted walk cycles and no expressions of emotion or facial movements during dialog. An in-game journal does display a number of outstanding sketch-style artwork whenever new enemies or characters are encountered. Oh yes, and there a unicorn somewhere in the game, too. I promise. Sadly, the sound design pretty much ensures that the list of positives starts and stops with the graphics. In-game music isn’t bad, per se, but neither is it memorable. Worse offenses come in the form of clear omissions; for one, there is no voiced dialog apart from some standard battle cries. While not a deal breaker in itself, the lengthy pauses when on-screen text is displayed — particularly during the slideshow cinematics where each screen lingers well past even the slowest reading speed before ticking over to the next scene — make it hard not to imagine that these were all programmed in with voiced dialog in mind prior to that feature being cut. It feels anticlimactic and unfinished, at best. 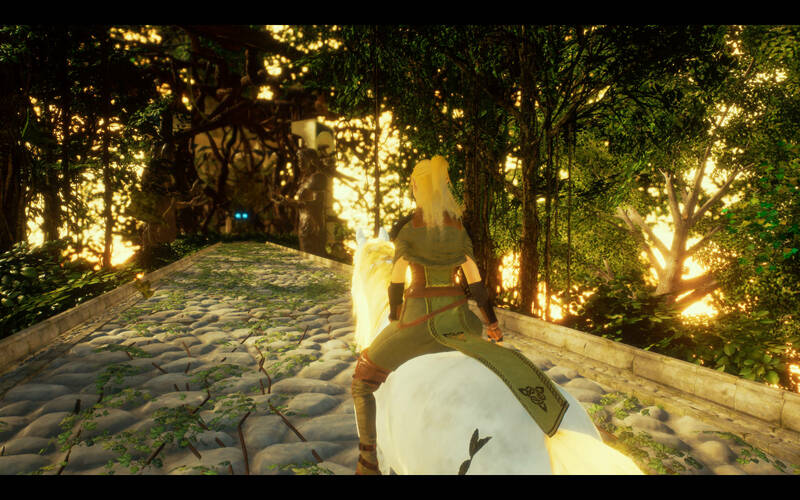 Eternity: The Last Unicorn bills itself as a game marrying the best of modern and classic gameplay styles into a cohesive whole. But there’s criminally little to celebrate here. One part of it is that rigid camera angles require far more careful design considerations that what is seen here, particularly in boss arenas. There’s just an overall lack of polish to the combat system, storytelling, and flow of gameplay that belies any goodwill I might have carried into this experience. When the hardest thing about a game is finding the strength to slog through its mundane gameplay and infuriatingly slipshod combat system, it’s time to look for a challenge — or simple fun, even — elsewhere.